Chromecast Audio is Chromecast for your ears. You plug the circular puck into a speaker and then cast sound from your phone, tablet, or PC. If you already have a bunch of speakers lying around, this is a relatively cheap way to wirelessly stream music regardless of which room you're in. Even cooler, you can stream audio to multiple rooms at once. 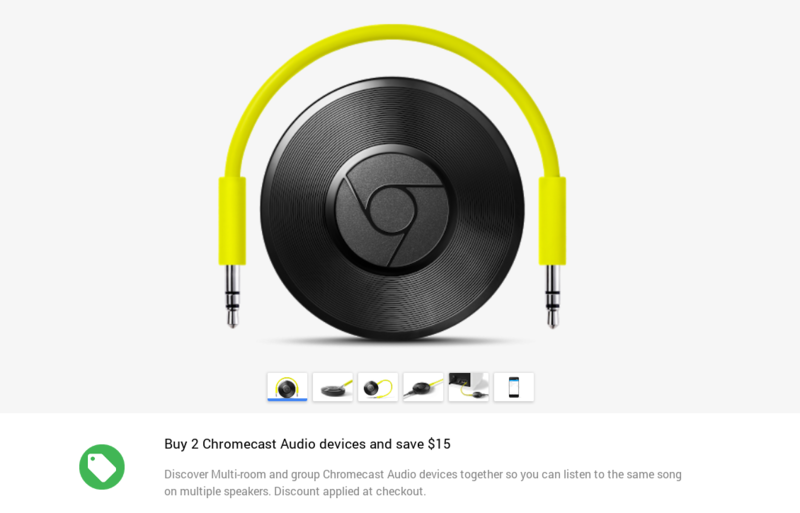 A Chromecast Audio costs $35. Since you're probably going to want more than one, now would be a good time to consider picking up a unit from the Google Store. There you can save $15 when you place an order for two devices. The discount will appear at checkout. In case you need help making up your mind, here's our review. In short, the Chromecast Audio isn't the ideal solution for everyone, but it can save you a whole bunch of money. With this deal, make that $15 more. And if you want to cancel out those savings by buying some expensive adapters and cables, you can snag those from the Google Store while you're there.